FROM THE PETERBOROUGH DIRECTION ... take A16 towards Spalding going straight ahead at roundabouts until you reach the Cowbit/Mouton Chapel roundabout. Take the 3rd exit onto Moulton Chapel Road (B1357). In Moulton Chapel turn right onto Roman Road driving passed the Jolly Farmer Public House on the left hand side, and Village Stores/Post Office and Garage on the right. Follow this road passed the Primary School travelling up to the T junction. 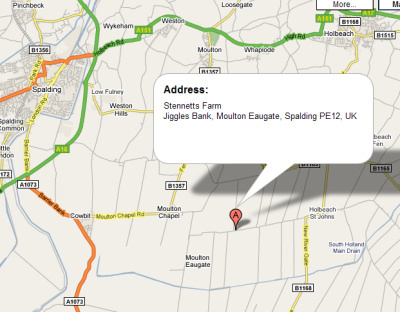 Turn left onto Jekils Bank, and we are the first Farm on the right hand side passed the Farm Shop. Approximately one mile from the T junction. FROM THE SPALDING DIRECTION.... take the A16 adjacent to the Springfields Festival Gardens towards Peterborough until you reach the Cowbit/Moulton Chapel roundabout. Take the 1st exit onto Moulton Chapel Road (B1357). In Moulton Chapel turn right onto Roman Road driving passed the Jolly Farmer Public House on the left hand side, and Village Stores/Post Office and Garage on the right. Follow this road passed the Primary School travelling up to the T junction. Turn left onto Jekils Bank, and we are the first Farm on the right hand side passed the Farm Shop. Approximately one mile from the T junction. FROM THE HOLBEACH DIRECTION....turn into Church Street from the centre of Holbeach passing the Parish Church on the left hand side. Continue on this road heading into Holbeach St Johns, travelling through the village turn right into Jekils Bank. Follow the road passed the Fenland Airfield heading towards Moulton Chapel and the farm is the first Farm on the left hand side, approximately 1 mile after the airfield.